I work hard to make sure that all my customers get the most form their Yorkshire Terriers. Here are just some of the lovely emails I receive every day from happy Yorkshire Terrier Savvy customers. If you would like help with your dog I’d be delighted to help you too. “I was looking for more information about my Yorkie puppy. In the past I had two afghan hounds and a Yorkie who lived to be 15 years old, but starting over, I needed a refresher course. Also, I wanted my 15-year-old daughter to learn as well. The format great and love the email updated and words of support!!! We love the way you write! Janet Hermann-Meh, Columbia, Maryland, U.S.A. 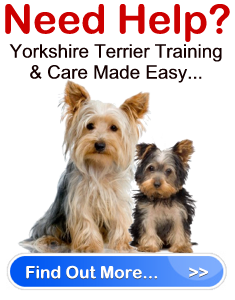 If you would like to know how to make your Yorkshire Terrier happy healthy and obedient click here.